Coolaroo hand crank operated outdoor roller shades features our unique knitted fabric to provide the ideal outdoor shade product. Perfect for any outdoor space, including pergolas, decks, and patios, our weather resistant fabric and components resist fading, ensuring your shades will look great for a long time. Coolaroo outdoor shades provide a fresh, unique, stylish addition to any decor. 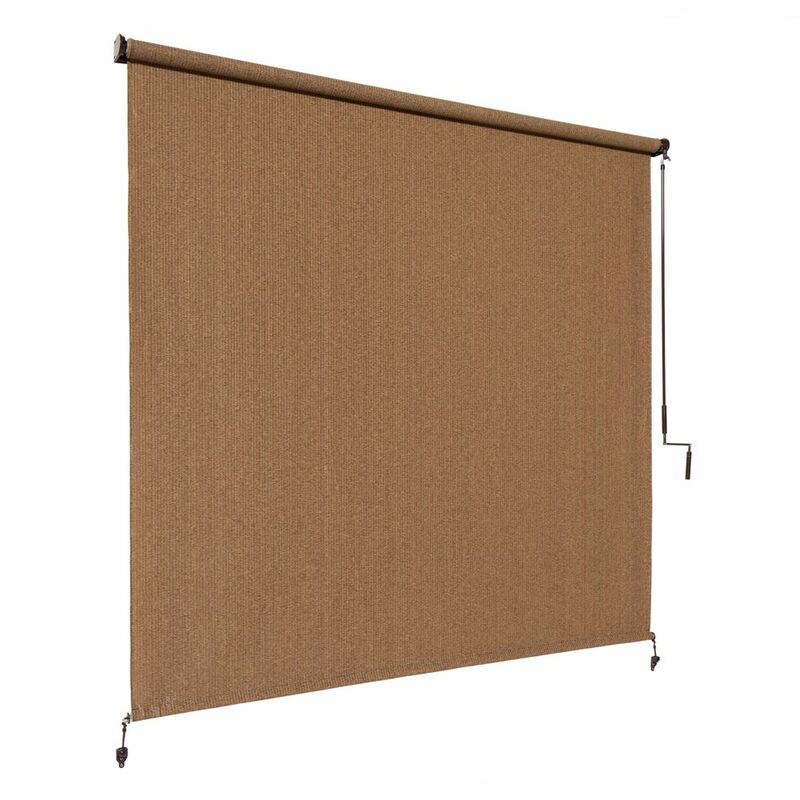 Outdoor Crank Roller Shade with 95% UV Protection0 (6 ft. x 8 ft.) Walnut Coolaroo hand crank operated outdoor roller shades features our unique knitted fabric to provide the ideal outdoor shade product. Perfect for any outdoor space, including pergolas, decks, and patios, our weather resistant fabric and components resist fading, ensuring your shades will look great for a long time. Coolaroo outdoor shades provide a fresh, unique, stylish addition to any decor. Outdoor Crank Roller Shade with 95% UV Protection0 (6 ft. x 8 ft.) Walnut is rated 4.7 out of 5 by 197. Rated 4 out of 5 by Hollywood from Be mindful of the blind dimensions vs. the mounting hardware dimensions when selecting this produ... Be mindful of the blind dimensions vs. the mounting hardware dimensions when selecting this product. When several blinds are to be installed abutting one another, the hardware mounting dimension requirements will leave a 3 to 4 inch space between the adjoining blind fabric. This additional spacing will need to be factored in to the overall dimensions of the space you are intending to cover. Rated 5 out of 5 by M13J from I purchased the 72x96 Walnut. Looks great! And is easy to install. It definitely makes a big di... I purchased the 72x96 Walnut. Looks great! And is easy to install. It definitely makes a big difference with the sun blasting on our patio in the late afternoon. Our patio faces West and when the sun is going down, its a little too much trying to eat outside at the table. I need to buy another one. I probably should have bout the 96x96 but i think that would still be a little short in giving shade for the entire table. The 120 is HUGE!!! but would have done the trick. Rated 5 out of 5 by Gary from Very nice for the money. Easy to install and... Very nice for the money. Easy to install and look good. No complaints at all. Rated 5 out of 5 by HomeDepotCustomer from Great product! Need two people to install but... Great product! Need two people to install but not that hard to do. Looks great! Really cuts down on heat coming into our home . Thanks for a great price too! Rated 5 out of 5 by Judie from They are extraordinary. Great shade . ... They are extraordinary. Great shade . We have ours on the outside and they have endured terrible wind and rain and stayed fastened. We live in Florida and they get the morning sun everyday and the quality is still excellent. Just bought two more. Plan to order more. Custom made. Rated 4 out of 5 by Dina from Cordless!.... Bought it about a month ago, had it installed last week. Don't know yet how muc... Cordless!.... Bought it about a month ago, had it installed last week. Don't know yet how much it will filter the sunlight. What I was looking for except I thought it would be heavier weight material. Is this blinds width 72&quot; or 96&quot;? Can the width of the blinds be trimmed?